When Guy Ligier who had been a regular member of the French national team finished playing rugby, he turned to motor sport - first as a driver, and then as a constructor of Formula One cars. With his lack of success in Grand Prix racing, he also dabbled in producing electric vehicles which can still be found running around the streets of Paris. 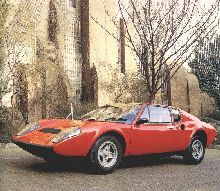 Ligier made just one sports car: the JS2. The initials stood for Jo Schlesser, a friend of Ligier who was killed during the 1968 French Grand Prix whilst driving a Honda.